FIs appeal to a wide audience of retail and enterprise customers, both of which have different needs. This brings up an important question. How do financial institutions meet the demands of each audience? 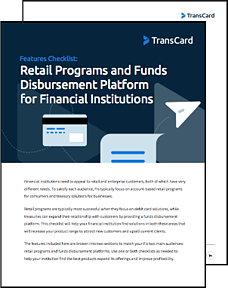 Quick answer: FIs focus on retail programs for consumers and treasury solutions for businesses. When evaluating potential platforms and programs, the best options will include a variety of product solutions, features, and the ability to launch the program in as little as 60 days. This checklist will help your financial institution find solutions in both these areas that will increase your product range to attract new customers and upsell current clients. Download the features checklist now.